Participants learn to connect with their tango partners during a H.U.M.P fitness event at Belltown Community Center. As much as we’d like to deny it, the truth is that fall is just around the corner. When temperatures begin to drop and rain stakes its claim on the city once again, many people seek ways to bring their workouts indoors. Participants in Belltown Community Center’s Introduction to Tango H.U.M.P fitness event. Belltown Community Center introduced an indoor fitness series this year that features unique classes for people who find the treadmill monotonous. The series is called H.U.M.P, which stands for Healthy Urban Movement Parties. The H.U.M.P events appropriately take place on the second hump day of every month, Wednesday. Each month the event has a different theme. So far, events have featured Zumba, burlesque, hula hooping and more. First Hill resident Amy Saba has attended many of the H.U.M.P events. Saba used to be an avid runner and got her exercise training for half marathons. Recently she injured her leg and was advised to look for lower-impact fitness options. On Wednesday, Sept. 10, the H.U.M.P theme was tango. Instructor Gabriela Condrea has been teaching tango for four years and said she was excited to be part of the series. Condrea teaches people to develop connections with their partners rather than to focus on getting the steps just right. The next H.U.M.P event will be held at Belltown Community Center on Wednesday, Oct. 8. No advance registration is necessary and the cost is $5. For information on the next event, please visit the community center’s Facebook page at https://www.facebook.com/Belltown.Community.Center. Seattle Parks, Seattle Seahawks and the Austin Foundation bring you Play 60, the NFL movement for an active generation! Compete with Blitz in relay races and more! Kick off the summer the healthy way and get active with the Seahawks on Saturday, June 29 from 12:00 p.m. – 2:00 p.m. Seattle Parks, the Seahawks, and The Austin Foundation have joined together again this year to bring you this fun, free event. Registration is not required and people of all ages are welcome. The event takes place from noon to 2 p.m. Saturday, June 29 at the Green Lake playfield next to the Green Lake Community Center, 7201 E Green Lake Dr. N.
Participants should wear athletic shoes, shirts, and shorts and bring a water bottle. Seahawks gear is welcome! Youth younger than 18 should bring a parent or guardian to sign the waiver. Play 60 is the Seattle Seahawks’ effort to help kids get fit and stay fit by putting in 60 minutes of active exercise every day, and it aligns with Seattle Parks’ Healthy Parks, Healthy You initiative and the mission of the Austin Foundation, “Transforming lives through fitness.” For more information on Play 60, please go to http://www.seahawks.com/youth/play-60/. For more information on Healthy Parks, Healthy You, please see http://www.seattle.gov/parks/healthyparks/, and for more information on the Austin Foundation, please go to http://www.youthandfitness.org/. Back by popular demand, this six-week class offers an hour once or twice a week of the best body conditioning and muscle toning exercises for every body type and fitness level. A certified and experienced Boot Camp instructor delivers guidance, encouragement, and safe and effective exercises in a friendly environment. Every participant will be challenged differently at his or her own level. For more information, please call Antoinette Daniel, Citywide Athletics Recreation Program Coordinator, at 206-684-7092, or email her at antoinette.daniel@seattle.gov. The Seattle Seahawks and Seattle Parks and Recreation opened a fitness center at the Garfield Teen Life Center today. The new “Seahawks PLAY 60 Youth Fitness Zone” will provide access to quality fitness equipment and programs to local youth in order to help them obtain 60 minutes of physical activity per day. “We are excited to partner with two organizations that are committed to providing the resources and expertise to help our youth achieve their goals both on and off the playing field,” said Seahawks president Peter McLoughlin. A key component to the partnership is a contract with the Austin Foundation to provide dedicated fitness trainers to support the program and monitor the participant’s progress through the existing Garfield Teen Life Centers health and fitness programs. With the support of this donation, Seattle Park’s Teen Express Fitness Program will now operate in the center. 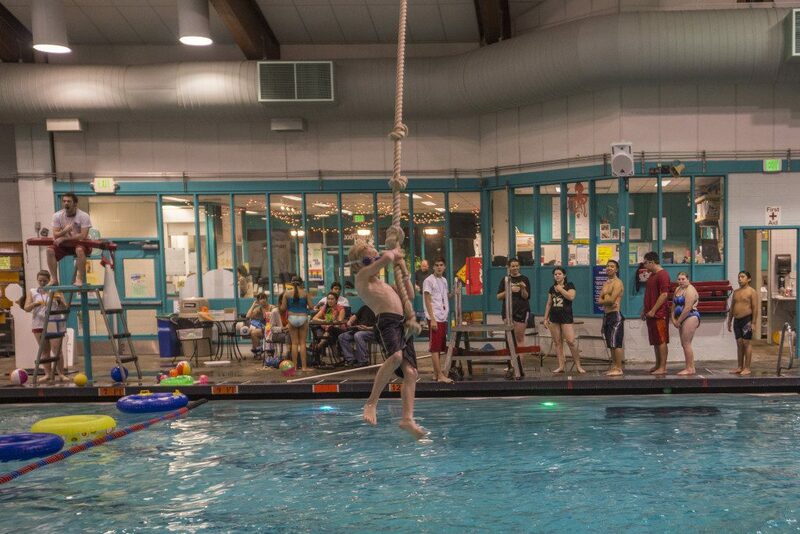 The Seattle Park’s Teen Express Fitness programs focus on exercise routines that engage teens and encourage them to make safe and healthy decisions. These programs also stress family participation by hosting monthly demonstrations on fitness and nutrition. Area youths will be able to register each quarter for a three month fitness program free of charge. The Austin Foundation provides coaching to youth in cardiovascular conditioning, flexibility, strength training and nutrition. This model allows each student to undergo a positive physical transformation that can carry over into other areas of his or her life. By focusing on individual fitness, each participant develops a sustainable set of skills and motivation to make healthy choices. The Garfield Teen Life Center, in Seattle’s Central Area, is well-known for its unique and diverse programs for youth 14 to 17 years old. The facilities include a music studio, technology lab, basketball gym, full kitchen, multi-purpose room – and now a fully outfitted fitness center. The center hosts the Teen Late Night program, which provides a safe place for teens to hang out between the hours of 7 p.m. and midnight on Friday and Saturday nights. Activities include flag football, basketball, dodgeball, movies, cooking classes, martial arts, dancing, the lyricist lounge, and lots of games. PLAY 60, part of the NFL Movement for an Active and Healthy Generation, is a national youth and fitness campaign focused on increasing the wellness of today’s youth by encouraging them to be active for at least 60 minutes a day. The Seattle Seahawks are dedicated to helping kids be active and healthy by giving them the necessary tools, access and encouragement to PLAY 60 minutes every day. Since the campaign launch in October 2001, the NFL has dedicated over $200 million to youth health and wellness through NFL PLAY 60. Seattle Parks and Recreation invites the community to celebrate Olympic Day on Wednesday, June 23, at West Seattle Stadium, 4432 35th Ave. SW, from 5 – 8 p.m. The event is free and designed especially for kids ages 3 – 12. Meet Olympic athlete Emily DeRiel and Paralympic athlete Mike Peters, test your skills at Olympic events and rock out with the Recess Monkeys. June 23 is the anniversary of the founding of the modern Olympic movement, and is celebrated annually by thousands of people in more than 160 countries. Not only does it commemorate the birth of the modern Olympic Games, Olympic Day is an international effort to promote fitness and well-being and encourage Olympic ideals, such as fair play, perseverance, respect and sportsmanship. For more information, or if you would like to volunteer at the event, call High Point Community Center at 206-684-7422 or send e-mail to hallr@seattle.gov.